Forward, having a ground-covering fluid gait, is the foundation of balance and comfort for a horse, mentally and physically. Horses gotta move. Forward is also one of those concept words. There is a literal meaning, and then the meaning out-beyond, where ideas are more dynamic than words and the faint-at-heart quake. Forward is a way of movement but it’s also bright intention and positive attitude. It’s as mental as it is physical. True forward is the absence of stress or negative energy in the horse. He glides, he soars, he floats. You know when you don’t see it: A gait that scurries, tight and short, with a tense poll and braced neck, is not forward. It’s energy but it isn’t free. Or you still don’t see it: A gait that drags its toes, lead in front, with some stumbling, his nose might push out, he needs to toss his head, his front end pulls instead of a push from behind. It’s energy even less free. To some degree, all horses are flip-floppers, different in the high noon sun than on a foggy crisp morning, or in a new place with strange horses than at home in the same old routine. Then there’s a bit of quirkiness for no reason you can know. That said, if a horse is not forward, the first thought should always be pain or lameness. Don’t take it for granted, really check him out. Reluctantly, you believe your horse is sound and not forward. You push him, but he doesn’t want to go. You’ve been told more leg, so now you nag, pounding on his sides, bearing down with your seat, and yakking to anyone you meet about your lazy hay-burner. In the beginning, we are all taught to sit still in the saddle. Decent information for novice riders, especially horse-crazy girls so excited they bounce. Is there a time when that stillness in the saddle works against us? Groundwork is no different, are our feet the ones filled with lead? Over time, has that quiet body become sedentary, even a bit like a cinderblock? Think of it this way: In order to partner with a horse, we need to become physically connected with his movement but also mentally forward. We need to be the energy he needs in that moment. Instead of reacting to what just happened, we want to be thinking ahead to better forward. About now, you get a training aid, maybe spurs or a whip, and you use them to manipulate the conversation, to have your way. To be clear, I have no issue with the correct use of either aid, but they were never intended for use by lazy riders. If it’s groundwork, shake out your body, release your jaw. Feel your feet on the soil, your head cleared by the air deep in your lungs. Let energy rise in your core. As you cue, continue that life-affirming breath, move with intention and rhythm. Start right where the horse is and build slowly from there. Embody a confidence that draws your horse to you. In the saddle, ask for a walk but instead of judging his movement, check in with your own. You need the warm-up as much as he does; breathe into stiff joints, remind your shoulder blades where they belong, stride along feeling the change of how your shirt moves at your waist. Can your ankles relax so your legs fold softly around your horse’s barrel? Can your thighs release to allow your seat deeper in the saddle, each stride met with the release of your sit bone? No resistance. Now, remember transitions are the key to connection. A horse’s training can progress being screamed at by a drill sergeant, or by being inspired by the light-hearted praise of an equal. Your choice but it’s obvious one is much harder to maintain than the other. To be positive, listening, and engaged in every stride takes great mental strength. We tend to think of a riding ambition as a bad thing, but what if we were ambitious about aware in the moment and energetic? Isn’t that where we need to meet our horses? 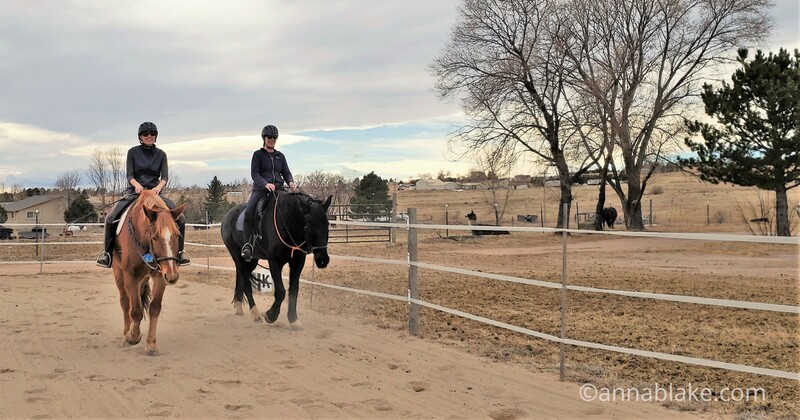 On the ground or in the saddle, use two words to answer your horse’s efforts; Yes and Good. It’s your job to come up with questions that would set your horse up to receive those answers. Time passes and you’ve both done some great work. You’ve been light and energetic. He has been forward and responsive. Can you tell when your horse begins to tire? Now you are looking for the slightest loss of forward, but for all the right reasons. Be so present in the ride that you can stop just before either of you want to. Finish strong and both you and your horse will come to the next ride with best expectations. Your timing is impeccable! Thank you. You have put in to words the feelings I have been trying to articulate. I feel that yes, there are standards but the human element creates a variety of approaches in training and in our relationships with our horses to reach those standards. What you describe is exactly how I want to learn and practice Dressage with my partner. I may be the odd one out at my barn but I feel connected to your following of riders. It gives me the confidence I need. Thank you. Because this works all the way up the levels, too. And when looking at the horses, the approach shows. You go, Girl. Welcome! You did it again! Wrote the words I needed to read. I’m inspired! Thank you. Thank you. There is always a point (or many) to ponder and learn from. Always grateful for your influence. It’s a moment to moment balance, glad you’re listening, Ruth. Thanks. Thank you. I needed to hear this. Jigs and I are trying to learn to dance…. Wonderful, trip the light fantastic! Thank you Anna! Somehow it hasn’t occurred to me to check my own energy when my horse is moving slower or faster than my intention. It seems the older I get, I to need to look in the mirror more often to find the root of my problems. Which unfortunately usually turn out to be me. Being self aware is really hard work. Thanks again for the necessary human cues. Laurie, for what it’s worth, don’t we all do this? It’s just easier to see when someone else does it. Like usual. Thanks for commenting. Another great read. Thank you. I especially love “Instead of reacting to what just happened, we need to be thinking ahead to better forward.” That is where I was earlier this week. I was sharing the arena with another boarder who was also doing groundwork. She was repeatedly cracking a lunge whip at her horse to try to encourage forward movement, but she was just getting a crabby face and pinned ears from her horse. I was at the other end of the arena. Suddenly my horse leapt in the air, and walked a few steps on his hind legs. The other gal watched me as I followed my horse across the arena and once he got all 4 feet back to the earth I encouraged forward movement. I did not admonish or punish. I had to think that was what the other human in the arena was expecting. My horse came back to focus on me, and we continued our dance. I secretly hoped the other human would learn from my example. Great comment, Mary. Well done. Thanks! Always the words needed just when we need them. Wise and knowing lady! Maybe ballroom dance classes would benefit riders? Light, balanced on the balls of the feet, with rhythm, joy and total co-operation. Lazyness in a horse is simply passive resistance, for whatever reason. Oh, that’s not my shirt moving at my waist, that’s flab, beneath which most bones and muscles are still sound. I hear the horse god and angels applauding you. I have a trainer friend, Andrea Datz, who trains using Tango… it’s fabulous. Well if we are talking ride to music, as a muso myself, its marches for the walk, polkas for the trot, and slip jigs (double jigs they go 1-2-3 1-2-3) for the canter, and live is best as every horse is different. Never got a grip on tango, and wonder how it fits a horse. Video of it? All the dressage music is cobbled up, mostly never exactly fits, just hits it here and there, maybe. Oh, but they love it when its live and it fits. Just need a “rhythm template” of a horse’s test. Or a video would do. I’ve played to them, but never made a CD for one. I would anticipate technical difficulties involving numbers of beats/strides, bars/circles, and transitions into other gaits/tunes. And so they cobble on. Love it. Thanks Anna. Are you riding like someone who’s been made to feel wrong every day of her life? Stopped in my tracks and wept. You have provided me opportunity to pause and reflect. So interesting, as my life is far from having been awfully awful, but still each time I go back to those words I weep. Perhaps a poet would write, “they capture the depth that poisoned arrows reach.” Thus now, I am more conscious of why my “thumping” requires something other than a physical change. Donnav, I had a short thumping and punching along experience recently, a mare who while she knew it all had lost respect and was “dead to the leg” and “dead in the mouth”. But inside that mare I found she is superb, just in a state of resistance (to a new owner, not myself). Spurs are for “putting against and digging a little” when there is no response to the leg (calf, not heel), and not for those without some ability, as they must not be used by accident, or thumping. Diligent use of spurs can lighten them up both ends. Then allow, as Anna puts it so well, relaxed and forward. A quick response deserves immediate freedom for movement. I read somewhere recently “The horse was born to go forward, but we impede him!” Free up, ride the horse, not his mouth, not the saddle, simply go with the horse. Bossing and fighting never works. Maybe something is hurting him? Suss it out while grooming. If you can let your stirrups down, do so, it will bring your seat forward and improve balance above his front end, which is vertcal pillars, weight carrying. The engine and springing is in the hind, and it doesn’t do to be sitting on the drive shaft. Lightly lighly giving until you find the joy of what is possible. I’m an educator and an artist. No creative soul ever worked for a brick, but will strive to the heavens for a morsel of praise. Well spoken and timely blog! Thank you, the crazy one for me is people who think their dog should come to them when they’re yelling at it. Ack. Thank you for more Wisdom! I have been toying with the idea of playing Argentine Tango music during my young boys training – your comment about dancing just solidified that idea. It is a conversation, a language, and can be composed of simple koves – words – (if the dancers are learning), or be a complex poetry in motion. My young lad has a good sense of rhythm and when we put the saddle on him last week, for the first time, he seemed to enjoy the feel/sound of the pannels flapping as he moved. I think I am going to play Argentine tango for him next session! Andrea relates the lead and follow aspects of Argentine Tango so well. It is a great analogy. Thanks Carole. I , too, hate it when I hear someone describe their horse as “lazy.” That is such a HUMAN construct. Thank you for including some ideas for groundwork with this as I am not in the saddle these days. … just another really meaningful post. Thank you ! Great post! I lent a friend my horse who generally has a very free and fast walk, being a Morgan. I led with my other horse who normally has a slower walk, hoping to slow her horse down a bit since she seemed a bit fearful, even though she used to hunter jump. She never let go pressure on the hackamore, in spite of me telling her she was cuing him to stop while asking him to go with her feet. I think sometimes people are scared to let go; to feel that swinging movement and free energy. So sad. Horse can’t pull if you give him nothing to pull on. Are the horses about us to show us not to be such control freaks?